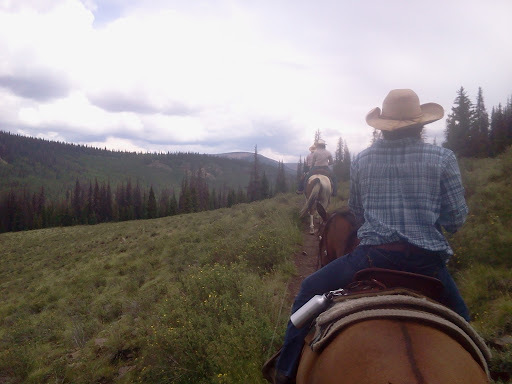 Today had the potential to be awesome, except the weather turned sour...we drove up to Creede to head into The Wheeler Geographic Region on horseback....halfway there it started to cloud up...then we ran into two hikers who had turned back due to lightning they saw on the horizon. Too much green grass. My horses are not grazing all day anymore, and it seems my example is being followed. Charlie and Ringo have both been great after their incidents so I truly hope that was a big part of their issues. I cannot read your blog. Appears to be white font on white background? Tried Chrome and IE to make sure it wasn't just my computer. It might be but of all the blogs I read, yours is the one I can't. If I do Alt-A and highlight the whole screen, I can read it. I can see the pics!